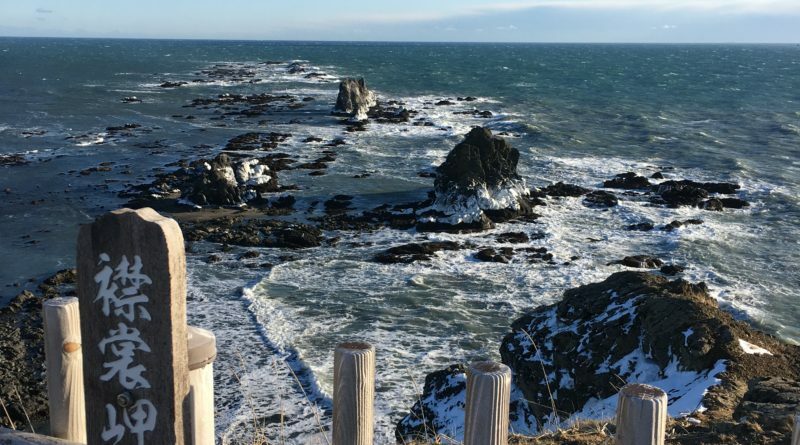 Explore Hokkaido’s beautiful coastline. 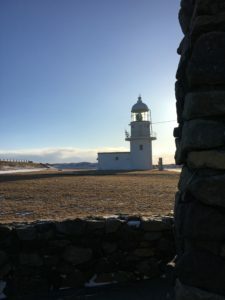 Visit Erimo Misaki. 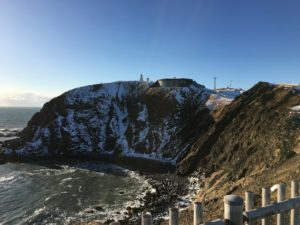 Driving Hokkaido’s coastline, there is always something to see. Quiet fishing villages, amazing rock pinnacles, and of course the blue of the water itself. A quick check of a Hokkaido map and it’s hard not to notice that most of Hokkaido is shaped like a diamond, with a very sharp southern point a couple hour’s drive south of Obihiro. That tip is the Erimo Misaki (Cape Erimo). Roughly 240 km south-east from Sapporo, on a recent drive there I passed through three separate climates in just a few hours. 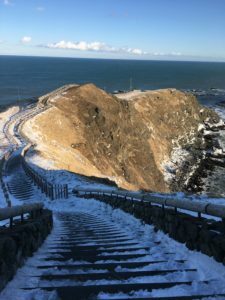 Heavy snow in the Ishikari region from Sapporo to Chitose gave way to minimal snow and clear roads as you drive the long coastline from Tomakomai in Iburi to Samani in the Hidaka region. The last few kilometers to the Erimo point are a barren treeless tundra-like landscape due to the high winds of the point. 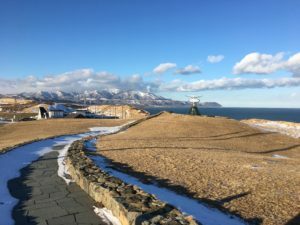 What makes the Erimo point special is the view from the lookout areas. 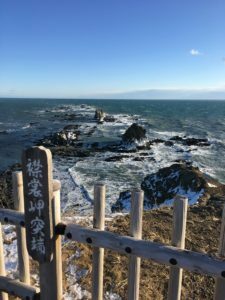 This is where Hokkaido relents into the sea, a pointed cliff gradually giving way to larger, then smaller rock islets, and finally tailing off into the ocean itself. I went there on a late January day. I arrived to an empty parking lot, a closed gift shop and indoor viewing area, and high winds. But there was blue sky, and the walkway was still accessible through the snow. 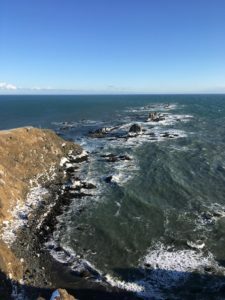 The walk beside the lighthouse to the upper lookout point was frigid, but the view was fantastic. Then, taking the stairway down along the ridge I went out to the lower, farthest viewing point. I can imagine in summer, busloads of tourists clogging this walkway. But, for now, it was mine and it was perfect. The Erimo Misaki is a natural wonder of Hokkaido and is free of charge. Access to the point is available year round.